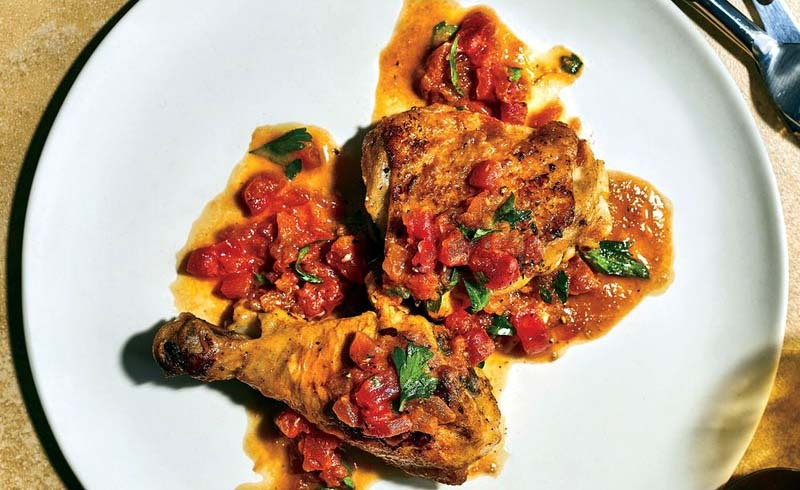 This modern French chicken dish gets flavor from red wine vinegar and a little bit of butter. One of the world’s most celebrated chefs and a leader of the French “nouvelle cuisine” movement, Paul Bocuse was an icon. Bocuse’s irresistible chicken, cooked with vinegar, represented two big trends of the times: big, bold flavor (from the vinegar) and a focus on overall lightness, which Bocuse championed. With just a handful of ingredients and simple directions, this is a dish we have never stopped making. This version swaps fresh tomatoes for tomato paste, uses lower-acid rice wine vinegar in place of red wine vinegar, and significantly reduces the amount of butter. [post_ads]Preheat oven to 200°F. Heat clarified butter and garlic in a large, heavy-bottomed skillet over medium-high. (The skillet should be large enough to hold all the chicken pieces in 1 layer.) Cook until the sound of sizzling butter has faded, about 3 minutes. Add chicken pieces, and cook until pieces are lightly browned, 5 to 7 minutes, flipping once after 3 minutes. Sprinkle liberally with salt and pepper. 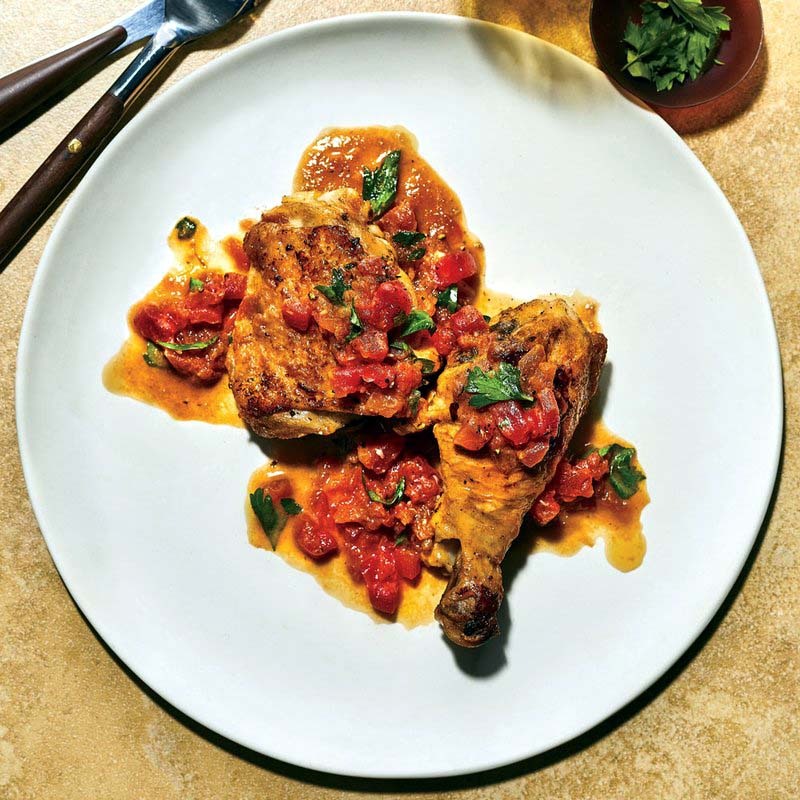 Add vinegar, and bring mixture to a brisk boil over medium-high; top chicken with tomatoes and parsley. Reduce heat to low; cover and cook until chicken is cooked through, about 15 minutes, flipping chicken pieces after 7 minutes. Transfer chicken to a baking dish, and keep warm in preheated oven. Using a spoon, skim and discard fat from surface of vinegar mixture in skillet. Continue to cook over low, undisturbed, until reduced by one-third, 3 to 4 minutes. Remove garlic cloves; peel cloves, and mash garlic pulp into sauce with a wooden spoon until blended. Add salt to taste. Whisk in 2 tablespoons butter until creamy. Transfer chicken to a platter; pour sauce over chicken, and serve immediately. To clarify butter, melt unsalted butter (any quantity you like—it keeps well in the refrigerator) in a saucepan over very low heat until clear. Remove pan from heat, and allow melted butter to stand for a few minutes until solids settle to bottom of pan. If there is any foam, skim it off with a spoon. Carefully pour off and reserve the clear liquid, which is clarified butter.